Your choice of 1 , 2 , or 3 Credits. This course explores integrating the ‘craft’ of writing into existing time constraints teachers so often find themselves in during Literacy blocks. By exploring crucial crafting components for best structure, story development and specific composure educators will be able to improve and integrate writing with other content areas. While this course is geared towards K-8 it can also be applied to higher grades and struggling students of any age. This course focuses in on 95 mini lessons for classroom implementation and is great as a literacy core or supplemental framework. Educators will explore the topic of writing integration through cross categorical content as a strategy for time management in the classroom. 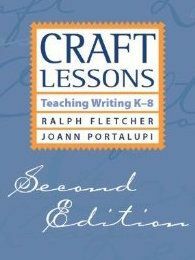 Teachers will examine how to use 95 mini lessons as a strategy for improving writing structure, content and clarity in the classroom. Educators will be presented with ways of instilling strategies for the overall improvement of students writing composition. Teachers will have the skills and knowledge to use the course content as a core framework during literacy blocks or as crucial supplemental support within existing curriculum mandates.